As a firestorm rages across Southern California near the end of one of the state’s worst wildfire seasons, much attention has been drawn to the bright red foam that’s dropped from planes in an effort to slow the fire’s spread. Chemical fire retardant can be an important firefighting tool. But it can also have some nasty ecological impacts, raising questions about whether it’s being used in the most responsible way. “These chemicals do not have a benign effect on the environment. They can be toxic—particularly to fish and aquatic species,” Timothy Ingalsbee, executive director of Oregon-Based Firefighters United for Safety, Ethics, and Ecology (FUSEE) and former Forest Service and National Park Service firefighter, told Earther. Fire retardant—which is fertilizer mixed with water and other chemicals—slows the rate of a fire’s spread by coating its fuels and thus depriving it of oxygen. Federal use of the stuff has exploded in recent years, from about 8.5 million gallons in 2012 to 19 million gallons in 2016. At certain concentrations, chemical retardants can kill local fauna outright. In 2002, a U.S. Forest Service fire retardant drop landed in Fall River, near Bend, Oregon. The red liquid killed 22,000 fish in a four-mile stretch of river in one day. Forest Service regulations stipulate that fire retardant is not to be dropped within 300 feet of any waterway. But mistakes happen—especially when pilots are flying above smoke at 150 mph, and can’t even see the ground beneath them. 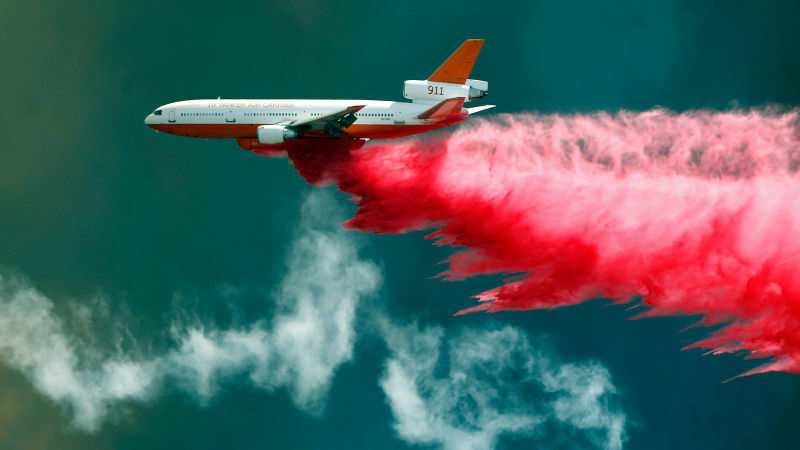 The main retardant used by the Forest Service to fight fires is called Phos-Chek. It originally belonged to Monsanto, and has since been acquired by Israel Chemicals Ltd. While the exact ingredients are proprietary information, we know it is basically fertilizer—ammonia phosphate and sulfate ions, water, and other minor ingredients. It can impact soil chemistry by adding nutrients, and that’s not always a good thing. “Lots of retardant was dropped on the wildfires in Napa Valley, which is home to world-class vineyards,” Ingalsbee said. Grapes evolved to grow in soil with relatively poor fertility, and it’s unknown what effect any contact with fire retardant will have on the vineyards. The Forest Service has been using fire retardants for decades, but did not carry out an environmental impact analysis until 2007, when it was ordered to by a federal judge following a lawsuit filed by Forest Service Employees for Environmental Ethics (FSEEE) in 2003. The environmental impact analysis found that retardant increases soil nutrients, however, it downplayed the impact of retardant in waterways, saying the effects from an uncontrolled wildfire would likely be worse without the use of fire retardant. Some, like the Forest Service, are of the opinion that these environmental impacts are justified, as they’re less damaging than the effects of wildfire itself, Ingalsbee said. But that’s assuming that retardant is even effective in the first place. And questions are being raised about that issue. Andy Stahl, executive director of FSEEE, the organization that sued the Forest Service and prompted the environmental analysis, said the Forest Service has never shown that retardant makes any difference in the final outcome of fires. “The Forest Service has never studied that question,” Stahl told Earther, adding that he thinks they don’t want to know the answer. “They refused to look at the elephant in the room…we compare it to if the FDA approved a cancer fighting drug without doing any controlled studies to see if it reduced tumor size,” Stahl said. “In my 20 years of experience with the U.S. Forest Service, I have never met a single qualified fire manager who said it wasn’t effective,” Jones added. Fire retardant can be most effective when it is dropped ahead of a fire in conditions where ground crews can then take advantage of the slowed spread, Ingalsbee said. But too often, it is dropped in areas where it will do no good, he added. The best place to use fire retardant is near communities where human life is at risk, and where ground crews have access to get in and fight the fire that is being slowed by the retardant. The worst is dropping it in ‘wildlands’ where there are steep slopes, dense forests, and no ground crews. In that case, the fire may be slowed, but with no crews to stop it, it will eventually just burn through the retardant, Ingalsbee said. “Basically, they’re dumping it in the wrong times, places, and conditions where it’s least likely to be effective,” Ingalsbee said. Ingalsbee brought this issue across the country to Washington, D.C., where, in June, he participated in a Congressional briefing with House staff. He spoke on a panel with fellow scientists and gave a presentation about the costs and effects of fire retardants. He also visited some Senate offices during the trip, handing out a one-pager about airtankers and retardants. According to the fact sheet, the most justified use for aerial application of retardant—when a wildfire is spreading towards homes, and where on-the-ground crews can arrive and engage the fire—accounts for just four percent of federal airdrops. Meanwhile, 21 percent of all drops are in designated wilderness, and another six percent are in remote, uninhabited areas. In those areas, wildfire is often beneficial ecologically and doesn’t endanger human life or property, making retardant drops a “waste of taxpayer money,” the pamphlet concludes. Stahl and Ingalsbee believe that in most cases, fire retardant is being dropped more as a show of force—that something, anything, is being done to stop the fire—than for its effectiveness in fighting fires. “And the public is happy because it looks like the war is being won when planes are bombing from the sky,” Stahl said. Are Wooden High-Rises the Real Deal?